Govt approval/Accreditation and Memberships - Ballsbridge University , Quality Accredited Education, Promoting Lifelong Learning and research,MBA, PhD. DBA. 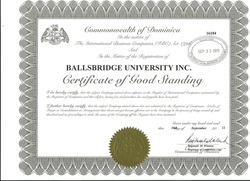 ..
Ballsbridge University is chartered and recognized by the government of Commonwealth of Dominica - a United Nations Member State - as a Higher Education Institution (HEI) with Reg. No. 16184 and a Certificate of Good Standing as per the COMMONWEALTH OF DOMINICA LAWS. BU is legitimate and self regulating awarding Body with accreditation framework duly chartered and legally empowered to function under the statutory laws of commonwealth of Dominica. BU is accredited by both academic and professional bodies which provides the reassurance of a credible, academic, industry recognized qualifications. BU is a basic member of the Accreditation Agency Curaco(Dutch Caribbean Ministry of Education), Netherlands. Ballsbridge University is also signatory body of CCLP world wide educational charter with consultative status with UN Economic and social council also recognized by California University FCE and california state university foreign evaluation dept for US equivalency degree. Ballsbridge University Approved by the Allied health Board Ghana for students to participate in the National Exams to Practice their Medical Professions in West Africa. BU quality assurance department has a reciprocal recognition with chartered quality institute incorporated by royal charter in UK and listed by the United kingdom government department of skills and innovation. our members may join CQI membership which demonstrate a strong commitment to quality assurance.The university observe the CQI code of quality practice. BU is fully accredited by Cambridge Institute of world Chartered Accountants, London institute of world chartered economist, England institute of world chartered economist,Oxford institute of world chartered accountants. All graduate with experience can apply for chartered regulatory professional Qualifications from above institutions. BU is certified to ISO 9001:2008 and the quality manual is regularly audited by BQS. BQS is a member of International Quality Assurance Agencies for Higher Education. Degrees conferred by Ballsbridge University have been internationally recognized by the Governments and private sector and also accepted by multinational businesses as well as by colleges and universities for further study. The University was endorsed to the Generally Accepted Accrediting Principle GAAP and all transcript are in GAAP, BQF and ECTS. Under this Agreement undergraduate students are require to complete a minimum of 30 GAAP credits, 60 ECTS credits,120 BQF/QCF credits per year and total Bachelor degree credits 120, Master 45 credits, Doctorate 60 credits above master degree. The university is a member of BQS and uses the qualification standards of BQS. 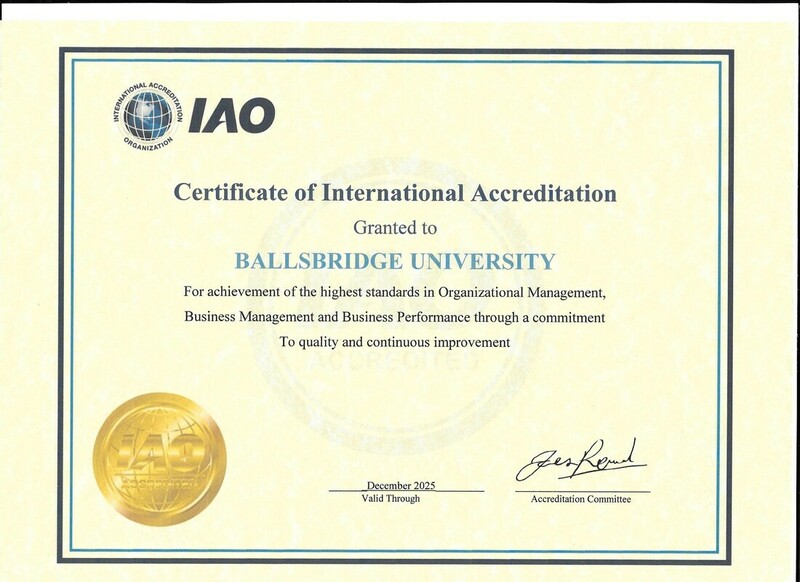 Ballsbridge University is accredited by International accreditation organization IAO 2015-2025. IAO is an international quality assurance agency for Quality assurance in education. IAO is collaborating with several ministries of education around the globe.Currently the following agencies are partners with IAO: Department of Adult & Higher Education, Ministry of Education (Bhutan), The National Commission for University Evaluation and Accreditation (Argentina), The National Higher Education Accreditation (Costa Rica), The Accreditation and Quality Assurance Commission (Palestine), The Agency for Development of Higher Education and Quality Assurance (Bosnia and Herzegovina), Accreditacion Agencia (Chile), The Quality Assurance & Accreditation Council (Sri Lanka), Public Agency for accreditation of Higher Education (Albania), Center for Quality Assurance and Accreditation for HEI (Libya) and Higher Education Quality Evaluation Centre (Latvia), etc. The BU is also an accredited affiliate of the California university FCE commissioned by some regional and national accredited universities in the USA to do curriculum and education programme evaluation . The Board of CUFCE has evaluated curriculum of ballsbridge university as the equivalent of the regional and national accredited Universities in the USA. California University FCE equivalency-degree evaluations are generally accepted for immigration as well as Federal, State and private employment arenas in USA and Internationally. California University FCE progressively promotes honesty, integrity as well as academic excellence in education. Kingdom Of Bahrain University Commission is an independent body in Bahrain. The commission also accepted and endorsed ballsbridge university to provide quality online education to Bahrain and citizens of MENA regions. 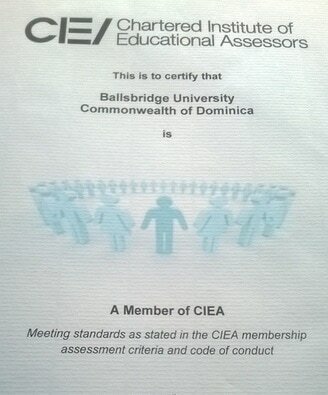 Ballsbridge University Is an institutional member of the Chartered Institute of Educational Assessors UK. The University is in compliance to all CIEA Quality Code of Practice . Council for Applied research, Evaluation,Education and Training have reviewed the curriculum of ballsbridge university as the equivalent of the regional accredited universities in USA. Students should apply to the board for USA degree equivalency degree and transcript report. Ballsbridge University international qualifications offer learners great opportunities for career development as well as progression into other higher, professional education and professional certifications around the globe. They are widely accepted by employers around the world as the benchmark for workplace excellence and provide learners with the skills they need to succeed in today’s fast changing economic environment and competitions. 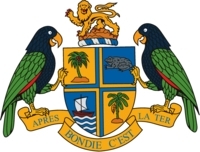 Commonwealth of Dominica licensed Ballsbridge University as per Dominica laws to operate and offer its programmes degree- and non-degree programs in various field of specializations. As a legal document, BU's apostilled degree is recognized by all member countries of the1961 Hague Apostille Convention.The Commonwealth of Dominica is a member of the British Commonwealth, the Organisation Internationale de la Francophonie and UNESCO. Dominica-licensed private international universities operating as transnational Provider are subject to statutory exemption and are the responsibility of the Dominica Registrar an independent body under the ministry of Justice rather than the Ministry of Education, which is concerned solely with domestic institutions. The relevant legislation is found in Dominica statutory rules and orders under which act the university is incorporated. The University's operation rests on the basis of its charter, approved by Dominica registrar an independent body under the ministry of justice, immigration and natural security which provides it with the government authority to function as a private international university. The university is regulated by Dominica registrar and its in compliance with all the standards of the registrar. Thus, any nation, it is generally agreed, serving as a member in good standing of the United Nations, has the power to certify, license, and accredit any institution of higher learning within its boarders. If that school is licensed, other nations of the UN are obliged to provide it the courtesy of recognizing degrees and certificates earned at those universities in every other member nation, simply as a matter of protocol. 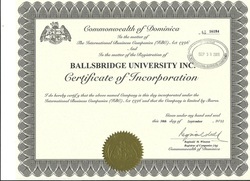 Ballsbridge University is licensed by the government of the commonwealth of Dominica. Ballsbridge University adjunct faculty and administration are located in various countries and degrees may be conferred in different jurisdictions where permitted by law. Under common law precedents concerning university title and the conducting of university work, Ballsbridge University is legally permitted to conduct all activities , including the conferral of degrees up to the doctoral level, in any jurisdiction that permits this activity. Ballsbridge University is a chartered institution and its responsible for its own quality assurance scheme. BU introduced a Quality Management System based on the rules and regulations of ISO 9001 2008. The system ensures highest quality throughout the University. The QMS system defines the organization and management procedures in every detail which are reviewed and adjusted by the Board of Quality Standards on a yearly intervals. The chairman of board of quality standards has appointed a Chief of Quality Management who is most experienced in the implementation of Quality systems based on ISO 9001 in various industries. ISO is recognized in 146 countries by inter-government agreement. 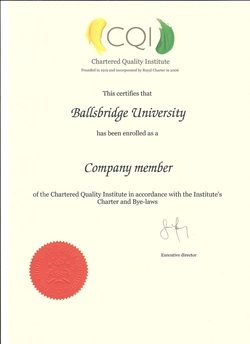 Ballsbridge University is a Company Member of the Chartered Quality Institute. The university is in compliance with all the code of practice of CQI regarding quality ,integrity and trust in all our dealing with our stakeholders. The CQI membership demonstrate to our stakeholders our strong commitment to Quality Assurance . Ballsbridge University adheres to the Principles of Best Practice for Cross-Border Higher Education as recommended in 2004 by the Council for Higher Education Accreditation (CHEA), the International Association of Universities (IAU), and the Association of Universities and Colleges of Canada (AUCC). Ballsbridge University comprises of professional bodies for management and management related professions. They offers membership designation and membership diploma. The professional bodies of BU also accredit schools and corporate members through the Board of Quality Standards for the professional membership . Ballsbridge university is a recognized member of education charter CCLP worldwide. The CCLP is an international organization with consultative status with UN economic and social council. BU approve membership number 10001152 endorsed by the international committee. Aldersgate University College. MBA degree programme of Ballsbridge University are reviewed and validated by the Aldersgate University college . The Aldersgate university college has been accredited by the commission on higher education(CHED) of the Ministry of Education, Philippines, and is listed in the International Association of Universities International Handbook of Universities. Graduates of an MBA program can go on to obtain a dual degree award from Aldersgate university college with transcript and copy of masters thesis on payment of a tuition validation fee. Contact the Vice chancellor of BU for the validation . St Linus University. DBA and MBA programme of Ballsbridge University is also validated by St Linus University for a second degree award subject to the payment of a validation tuition fee . The St Linus university is also accredited by CHED in Philippines. contact the BU vice chancellor for validation. University of Atlanta. MBA and DBA is also validated by university of Atlanta. The university of Atlanta is accredited by DETC and its recognized by CHEA and US department of education. Contact the vice chancellor for the validation. This is optional for American and Canadian students. Westminister University System. BU is affiliated to WUS and all their curriculum was accredited under the Ballsbridge Qualification framework (BQF). WUS is an affiliate of International University Panama accredited by the Ministry of Education of the Republic of Panama , it is also listed in the UNESCO International Association of Universities Directory of Higher Education, and the International Handbook of Accredited Universities, The Surapati University in Jakarta, Indonesia State Recognized University Accredited by the National Accreditation Commission of the Higher Education Republic Indonesia The Chancellor of WUS (Prof. Kemal Roemawi, MD.,Ph.D.) through Dr. Roemawi Foundation in Jakarta is fully authorized by the Chairman of the Surapati University to independently run, managed, developed and controlled the Parallel Executive Campus of the Surapati University, Jakarta. International Culture University Baglandesh is an affiliate of Ballsbrisdge university fully accredited in Banglandesh. Ballsbridge university students can also apply to ICU for dual degrees subject to payment of validation. Sastra Angkor Institute Cambodia is an affiliate of Ballsbridge University and fully recognized by the Imperial government of Cambodia and the ministry of education Cambodia. Graduate can also request for dual degrees of BU and SAI. Universidad Azteca European Programme is a recognized awarding body on its own right and a part of Universidad Azteca. Graduate from our campuses and open campuses are eligible for the dual degree Award. Poma International Business University is Accredited by Ministry of education Republic of Benin. BU and PIBU also award dual degrees to students on completion of their programmes in our affiliated campuses or through Ecampus learning. A strong indicator of the quality and relevance of our courses is our excellent record of accreditation from professional organizations, the best in the UK. Accreditation means that our courses have passed stringent quality tests and that our graduates are eligible to gain further professional qualifications such as Chartered Status or Incorporated managers status. The concept of accreditation (approval by one of the member institutions of the management specialist Board) is central to the thinking of the university. The membership of CQI demonstrate our Strong commitment to quality in all our dealings with stakeholders. The Ballsbridge University is in compliance with ISO 9001:2008 for Quality Assurance in Education and course curriculum accredited and reviewed by the Board of Quality Standards BQS and international Quality institute IQIHE both are professional bodies of BU with self governing fellows and consultants around the world . The BQS and IQIHE compliance for Graduate diploma 120 credits ,Masters degree 180 credits, Doctorate degree 240-300, Doctor of science 320 credits . Strategy As Practice International Network.Strategy as Practice is an international network of more than 2000 scholars and practitioners in over 100 countries around the globe. Coordinated by eight institutions, SAP-IN is committed to the importance of a focus on everyday processes, practices and activities involved in the making of strategy. Ballsbridge is an affiliate and all students and researcher in the university are eligible to register as members . EQAVET - European Quality Assurance in Vacational Education and Training. EQAVET is a community of practice bringing together Member States, Social Partners and the European Commission to promote European collaboration in developing and improving quality assurance in VET by using the European Quality Assurance Reference Framework. Ballsbridge has adopted the EQAVET Quality circle of quality assurance into their quality management manual and also subcribe to their news . The Institute of Financial & Management Studies (IFMS) is one of the world's largest Financial & Management professional body and premier provider of financial and management education, professional credentials, training, technical support and advocacy. Ballsbridge is a partner of IFMS and students are eligible for a certified membership upon their request . The European Parliament Transparency Register has been set up and is operated by the European Parliament and the European Commission. The Council of the European Union supports this initiative. Open & Distance Learning Quality Council .ODLQC was founded in 1969 as the Council for the Accreditation of Correspondence Colleges, becoming the Open and Distance Learning Quality Council in 1995. Set up at the request of UK government, it continues to benefit from governmental support and cooperation, though it is now an independent body, and a registered charity. The BU adopted all the standards of the council and is already incorporated in our quality manual. The Economics, Business and Enterprise Association (EBEA) is the professional subject association for teaching and study of Economics, Business and Enterprise. The association is sponsored by EDEXEL and the chartered institute for security and investment. Ballsbridge is a member of EBEA. The FPMTM was founded in 1983 in united kingdom to give greater fulfillment and satisfaction in our members’ careers by encouraging management excellence in business and technical areas. To help members achieve their personal aspirations, fulfill their career ambitions and develop their innate potential. To support lifelong learning and encourage education in management, business and technology. To give professional recognition to the knowledge and skills of our members. Ballsbridge University is a member of ICP and students and associate of the university are eligible to join the membership grades base on their qualification and work Experience. Only students of reputable and accredited schools are eligible to join . Ballsbridge University is an accredited member of the Board of Quality Standards (BQS) . The curriculum has been approved and accredited by the BQS , Graduate Diploma 120 credits , MBA 180 credits , DBA 240 credits ,Dsc 300 credits . The Institute of Management Specialists (IMS), founded in 1971, is a United Kingdom based professional qualification awarding body. IMS encourage management excellence and specialist expertise. The institute help members achieve their personal aspirations, fulfill their career ambitions and develop their innate potential. FIMBA is a world wide professional Membership association for MBAs and DBAs . All our curriculum is endorsed for membership grades . International Culture University is an Accredited affiliate of Ballsbridge University. All Qualifications of ICU are recognized by BU and other BU partners. Ballsbridge university is listed on united nations civil society registry under academics and its in pursuance of the consultative status with the economic and social council. UK Council for Graduate Education is the leading independent representative body for Postgraduate Education in the UK. Its mission is to be the authoritative voice for postgraduate education in the UK, providing high quality leadership and support to its members to promote a ­­­­strong and sustainable postgraduate education sector. Ballsbridge is listed with the council as international university. The DTSMSI is a professional body recognized in south Africa and is in collaboration with many institutions globally. BU is a partner of DTSMI. The overall aim of OPAL is to support open educational practice. This will lead to greater effectiveness of teaching and learning by enhancing the quantity and quality of open educational resources that can be incorporated into higher education and further education provision.OPAL has been established through international organisations including UNESCO, ICDE and EFQUEL in order to establish a forum which works to build greater trust in using and promoting open educational resources. The project is part funded by the European Commission Education and Training Lifelong Learning Programme. Ballsbridge University is listed on opal register . The university is in compliance with opal quality initiative on open learning . Due to the Increasing globalisation and professional mobility has led to a significant increase in students engaging in education across national borders. As a consequence, there is a need for academic institutions, evaluation agencies and employers to be able to assess the value of a particular qualification. A key principle in this process is that decisions on the value of a particular award, programme of study or part thereof are the responsibility of the receiving institution or organization. At Ballsbridge University , we assess the equivalence of international qualifications for the purposes of matriculation and awarding exemptions and/or credit transfers. Ballsbridge university makes use of Naric, a national agency that provides information on international qualifications. Naric is part of a wider network of centres across Europe, Australia, Canada, New Zealand and the US. Awards from Ballsbridge Universities are normally accepted as being equivalent to similar qualifications across the world.